Often we celebrate many holidays but don’t often know the meaning behind them and what they represent for the culture. In my goal to showcase different cultures and the food behind the culture I believe it is so important to also inform ourselves what these celebrations mean. Cinco de Mayo is an annual celebration in in commemoration of the Mexican Army’s victory over the French in the battle of Puebla. This was significant because the Mexican army was outnumbered and the French hadn’t been defeated in almost 50 years. Some argue that this battle was also significant for our own history here in the United States and could have changed the outcome of our country had this battle gone any differently. While in the United States this day is a celebration of Mexican-American culture ( which we often see in the form of food, margaritas and community), In Mexico it is more ceremonial although still celebrated within community. If there is one food group in life I love more than donuts, its tacos. I mean but it in all honesty I pretty much love everything. I remember watching an episode of one of my favorite TV shows “The Chef’s Table” and there was an episode talking about tacos. 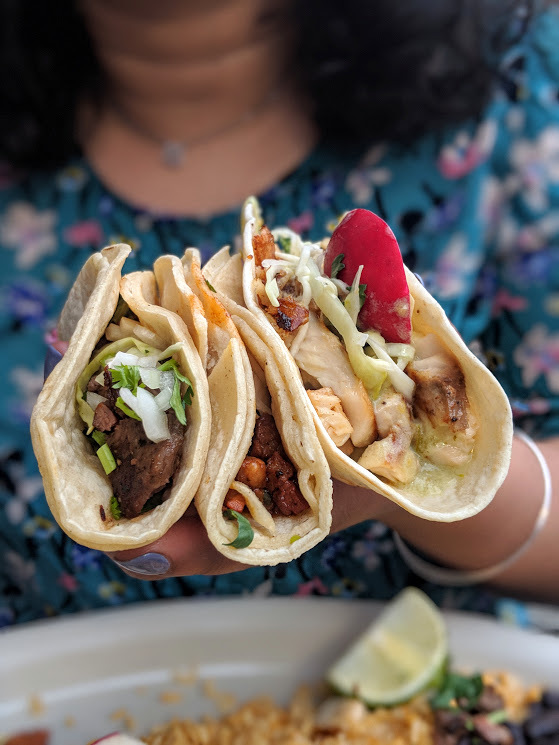 The way the tortillas are made, the type of corn, the simple yet incredibly complex and delicious fillings etc… I remember being completely enamored with the idea of finding good tacos, in different forms from different restaurants. I find myself on the wildest adventure because everyone has “their” version of the taco: what it should consist of and how it is made. Also, Mexican food is so much more than tacos and this is something we can forget as well. From mole and its sweet complexity to the tamale ( which has its own history going back to the Aztecs) Mexican food is complex and deserving of praise. I hope that after reading this you all will want to delve a little more into the history and culture of Mexican cuisine and tell me all about your adventures. So off we go into some of my favorite local spots for Tacos. Enjoy! What I loved about Naco Taco was their unique fillings like duck confit & lamb. Their tortillas are house made & they have a really fun drink menu. I mean “Piña pa la Niña” anyone? The vibe overall is just so fun + their patio seating is legit. This late night spot was bursting at its seams with the college crowd. Located right in Harvard Square they are open until 4am for all your late night taco needs. Their tacos were bursting with flavor and stuffed with filling. Super tasty. This place is a bit out of Downtown Nashua but its worth the extra few minutes it takes to get there. They have a good selection of tacos + fresh Salvadorean pupusas handmade in front of you. Focusing on Central & Latin American cuisine they go next level with all sorts of different flavors and an extensive menu. They are also one of my favorite places to grab some coffee. Every time I go I try something new and have never been disappointed. Their tacos take on a different flair than typical fillings and are super fresh and tasty. This spot is near and dear to my heart. As a teenager I tried their location in Lawrence and when I heard they were coming to Lowell I was super excited to relive my teenage taco dreams. It is also the first place I tried cow tongue tacos ( DELISH). May 5, 2018 May 5, 2018 by Timna N.
They all look so good! Now I need to do a taco crawl!